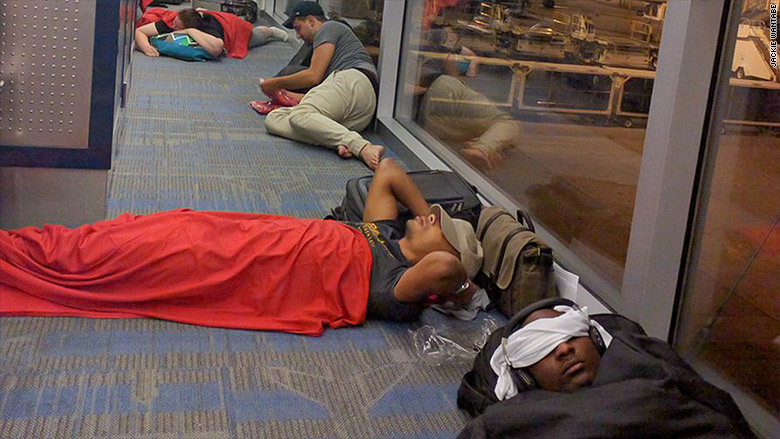 The week got off to a nightmarish start for Delta and its passengers. Delta Air Lines flights were grounded for at least six hours early Monday by a global computer system outage, causing large-scale cancellations and stranding hundreds of thousands of passengers. At 8:40 a.m. ET, Delta said the ground stop had been lifted but that only "limited" departures had resumed. It's expected that flights will be delayed and canceled throughout the day. "Customers heading to the airport should expect delays and cancellations," Delta warned. At New York's LaGuardia Airport, the flight information boards showed delays of several hours, and customers queued up at long customer service lines. Samantha Serrano, who had been set to leave La Guardia at 8:23 a.m., was sitting on the floor near the gate with her 3-year-old son at 10 a.m.
"It's way past his nap. He's not happy," she said. "He's got pancakes, which always keeps him happy." Delta flier Marcia Jackson, who was trying to get home to Detroit, said Delta employees had handled the situation "very well." Delta (DAL), the world's second largest airline, said the problem was a power outage at its Atlanta hub. The local electric utility, Georgia Power, said the problem was "a failure overnight in a piece of equipment known as switchgear" that affected only Delta. As of 3:40 p.m. ET, Delta said it had canceled more than 650 flights and had operated about 2,340 of the nearly 6,000 scheduled for Monday. The airline expects the number of canceled flights to grow. It will likely cost Delta tens of millions of dollars and take several days to recover from the disruption, according to experts. It will be at least Wednesday before the schedule is close to normal, said Jim Record, a retired airline pilot who is now an adjunct professor of aviation. Part of the problem is a limit on how long pilots can be on duty. "The clock kept going for crews, even if they weren't on the planes," he said. "There aren't a lot of crews to bring in to replace them. That's not how the system is designed." Even if Delta spares no expense, it can't just resume normal operations once it is flying again. "You have airplanes and crews out of place. You've got passengers all over," said airline consultant Mike Boyd. "This is something you can not completely prepare for." In a video filmed at Delta's operations center, CEO Ed Bastian said Delta employees are working around the clock to try to restore service. "It's an all hands on deck effort," he said. "I apologize for the challenges this has created for you with your travel experience." U.S. law enforcement found no evidence of malicious activity as a cause of the outage, a law enforcement official told CNN. During the worst of it early Monday morning, getting information on the status of flights was particularly frustrating for passengers. Delta conceded during the ground stop that it had trouble providing accurate flight status on airport departure boards, at delta.com, the Fly Delta App and from Delta representatives on the phone. 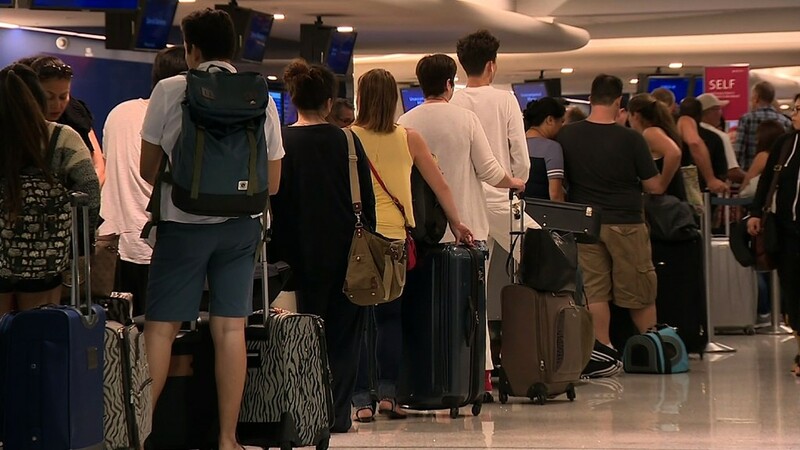 The airline is offering refunds to passengers on canceled or "significantly delayed" flights on Monday, though it did not specify how long a delay has to be to qualify. Passengers booked on a flight Monday whose flights are not canceled can make a one-time change to their tickets without a fee if they rebook and depart by Friday. If they rebook for a flight after August 12, the change fee will be waived, but they could have to pay the difference in fare for a new flight. Even passengers booked on a flight Monday whose flights are not canceled can make a one-time change to their tickets without the normal fee. But they may have to pay the difference in fare for a new flight. They will need to start travel by this Friday to benefit from the lack of a change fee. The Joseph family from Suffern, New York, arrived at LaGuardia Airport in New York early Monday morning for a flight to Orlando, the start of a vacation to Disney World for their six children. "Delta is just saying the systems are down and we are going to be late," said Frantzy Joseph, the family's father. "We're feeling OK. We're excited to go Disneyworld. We just want to catch the flight," said Claudia Joseph, the family's mother. Passengers on Twitter reported problems -- including the inability to check in or being stuck on the tarmac -- from airports around the world, including San Francisco, Rome and Athens. "The airline provided passengers with little information," said New Yorker Carly Hayes, who was due to travel from Fiumicino Airport in Rome to New York's JFK, in an Instagram post. Jackie Watanabe, who was due to travel from Las Vegas to Minneapolis, tweeted that the airline handed out blankets to passengers who wanted to get some sleep on the floor of the terminal. "I'm not ready to go into camping mode yet, but other passengers are," she said, tweeting a photo of sleeping passengers in Las Vegas. Sean Carson, who planned to travel from Kona, Hawaii, to Los Angeles, said he had been on a plane for more than four hours. He told CNN the pilot announced that pizza was being delivered. The Delta problems on Monday came less than three weeks after Southwest Airlines canceled more than 1,000 flights following a system outage. -- CNN's Samatha Barry, Aaron Cooper, Donie O'Sullivan, Shimon Prokupecz and Tristan Smith contributed to this report.